Law Land and Elizabeth Sykes Land where living on the Hauppauge property by 1900. They continued to live there at least until Law's death in 1926. 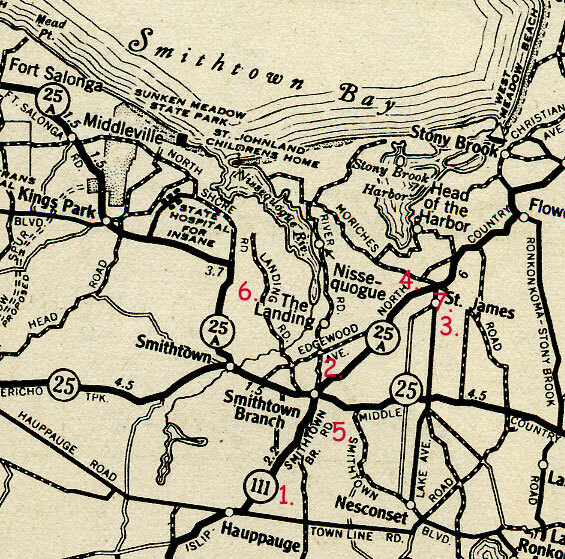 Sometime after Law's death, Elizabeth moved to Linden Lane in Smithtown. Their children, with the exception of Mary Land Wiedenkeller, all lived in Smithtown/Hauppauge. Law owned properties in Hauppauge and Islip. See Law Land and Elizabeth Sykes for general information on Law and Elizabeth and/or Pictures and Maps of where Law and Elizabeth lived and worked in Hauppauge and Smithtown . Frank Goehle and Isabelle Walsh started spending their summers in St James in the early 1930s. At first they rented a house on 50 Acre Road from the Granies. Later they had a "cabin" on Cambon Avenue. Circa 1944 they bought the house on Highland Avenue. See Frank Goehle and Isabelle Walsh for more general information on Frank and Isabell and/or Pictures and Maps of where Frank and Isabelle lived and worked in St James . Agnes Goehle and Bud Land lived in Smithtown after their marriage in 1842 until circa 1949/50 when they moved over the hardware store in St James. In the spring of 1951 they moved to Hackettstown, New Jersey. See Bud Land and Agnes Goehle for more general information on Bud and Agnes and/or Pictures and Maps of where Bud Land and Agnes Goehle lived in Smithtown and St James . Notice that the major roads are 25, 25A, 27, and 27A. 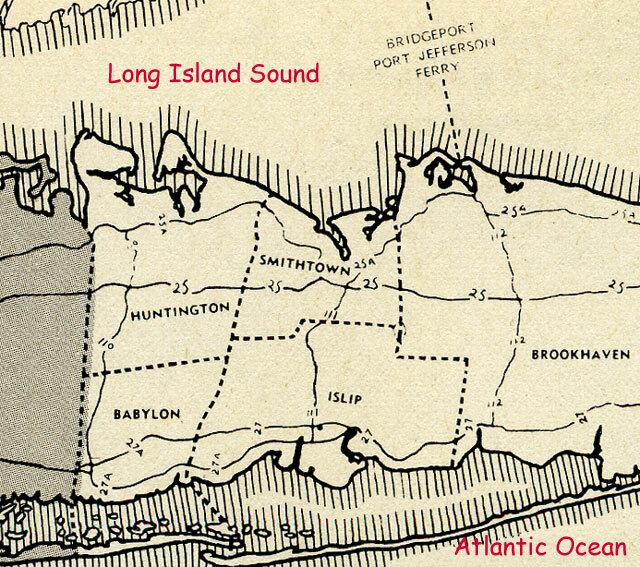 The Jericho Turnpike, Northern State Parkway, Long Island Expressway, Southern State were not yet built. Route 27 became the Sunrise Highway. The major highways on Long Island were built after WWII as a result of suburban development and the increased use of the automobile for commuter and recreational use. The property in Hauppauge that belonged to Lydia Law Land and subsequently to her son, Law Land. 101 North Country Road, Smithtown home owned by Percy Land and Meta Petermann. Cambon Avenue, St James, "cabin" owned by Frank Goehle and Isabell Walsh in the 1930s. The Hardware Store, Lake Avenue, St James, building owned by Percy Land, where Bud and Agnes lived from 1949 to 1951. Solid black = paved roads, "Asphalt, Brick, Concrete, Surface Treated". Dotted lines = improved roads, "Gravel, Stone, Shell,Topsoil-Sandclay ". Clear center = Dirt Roads, "Unimproved"
Not all the dirt roads are included on this map. Too bad there is not that kind of traffic today.